Waste tyre/plastic pyrolysis machine is a thermo decomposition of plastic /tyre polymer, since waste plastic/tyre are long chain polymers containing more than 50,000 carbon atoms attached to each other in a cross linked or straight chain. During high temperature processing, this long chain( C-50,000 to C-2,00,000) is broken down into smaller chain (C-1 to C-4 & C-5 to C-23).Among which, C5-C23 is oil got from long chain tyre polymer.In a word the whole processing of waste tyre/plastic pyrolysis machin is tyre/plasticsolid—oil gas—fuel oil liquid. Waste tyre/plastic pyrolysis machine is mainly composed of 3parts---host machine (reactor) , cooling system and dedusting system. Waste tyres/plastics will be heated and become oil gas inside reactor. 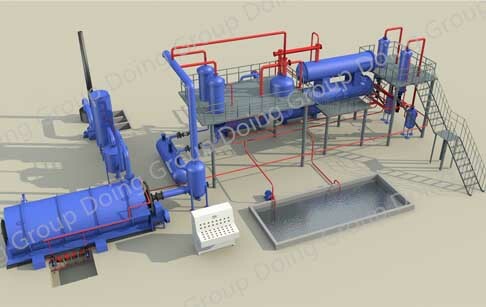 The oil gas will be cooled into fuel oil with water by cooling system in cooling system. Therefore, reactor and cooling system are very important for one set pyrolysis machine. A qualified reactor can ensure your machine work safely with long service life. On the contrary, an unqualified machine may bring you a lot of trouble or even disaster. Without reasonable cooling design, your oil yield couldn’t be high. On the other hand, part of oil gas will be wasted and converted waste gas. 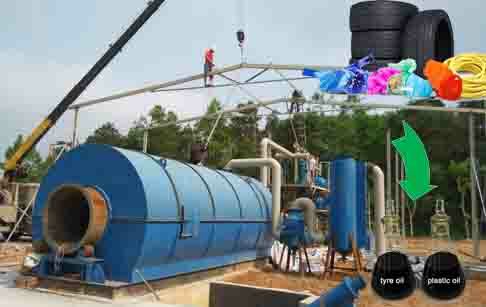 For waste tyre/plastic pyrolysis machine, cooling system decides your oil output rate. It also means your profit. Except safety and oil yield, environment protection is also important for waste tyre/plastic pyrolysis machine. We have special water dedusting system for smoke. After processing, the smoke will be as white as water steam being discharged out of chimney. With a green technology and safety waste tyre/plastic pyrolysis machine of high oil yield, if you have low cost scrap tires and plastic waste, it will be surely a good project for you. Prev:What is benefit of aluminum recycling machine? Next:How many waste tyre pyrolysis recycling plant in Mexico ? If you wanna to get more details about What is waste tyre/plastic pyrolysis machine? you can send E-mail to market@doinggroup.com. You can consult our professional engineer and specialized sales team with leave a message in below form.We will contact with you ASAP.You also can visit our factory in Henan,China.Get Detailed address.